The day was long. We spent most of it sitting in a cramped position. It took several hours to reach Londorossi Gate and then we had to wait for official clearance. Eventually we reboarded the bus and followed the track deeper into the forest. The Coaster did its best to live up to its name; it bounced through the ruts with enough force to give a super-ball a headache. It was mid-afternoon by the time we reached road's end. Slowly, we unfolded from the rig. We were packed in the bus like sardines for our ride to the mountain. Photo by teammember Nico Roger. Immediately I knew I was in trouble. Three steps out of the door and my right hamstring was a knot. Some nine months previously I had torn it off the bone (quite literally) in a water-skiing accident. Following a surgical reattachment, I had been faithful to the recovery plan. Still, those first steps off the bus were as painful as any I could remember. It was as if some cowboy kicked me in the gluteal fold with the pointed toe of his snakeskin boot. I hobbled off into the bushes ostensibly to pee, but also to panic in privacy. Should I tell somebody about this? Should I just get back on the bus before it leaves? What happens if this pain doesn't go away? What happens if my entire leg falls off and rolls down the mountain and I can't find it? I pulled myself together, came out of the bushes, and quietly slipped in behind the others. No one seemed to notice. They were chatting, snacking, rooting through pack pockets and adjusting straps. I stretched and nonchalantly dug my knuckles into the knot. Slowly it began to relax. So did I. I should have been massaging it before now. The porters quickly disappeared into the forest, loaded and balanced. Unlike us, the porters never hesitated as they came off the bus. Each was an amazing athlete. As our 30-pound bags dropped off the bus roof--one by one--a fellow would grab it according to some preordained order, sling it skyward, and catch it on his shoulders or head. Then, often without use of hands, he would disappear into the forest. They had the skill and knew the drill. I wonder how many trips these guys had made this season. After checking the status of bag transport, our lead guide, Robert, reminded us of the day's journey. It would a be a hike of three or four hours duration. 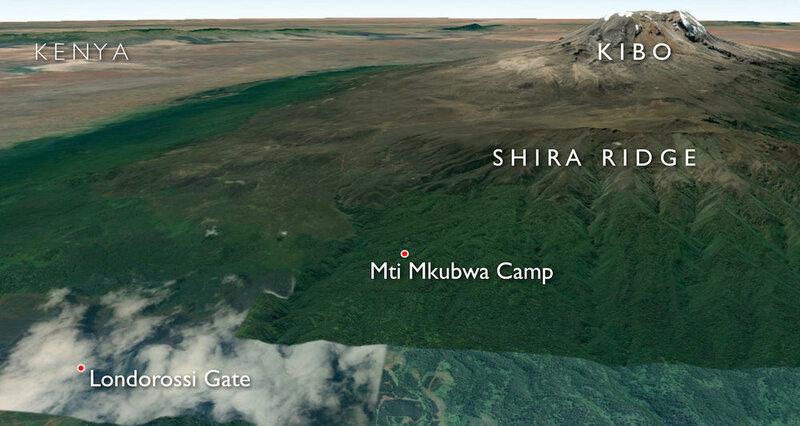 Vertically, we would climb about 1,300 feet from road's end to our first camp at Mti Mkubwa (Swahili for "Big Tree"). Imagery courtesy of Google Earth. We took a few more minutes by the road to mull around, use the loo, and snap pictures. When everyone was done, Robert walked toward the spot where the porters had been swallowed by shadow. "Let's go," he sang. My hammy was still in a wad but seemed to improve with each step. At least I told myself that. It was an inauspicious moment, but our ascent of Mt Kilimanjaro had begun. The trail was well maintained but gummy. Mud often makes this steep stretch of the trek one of the most difficult of the mountain. Fortunately, there was no precipitation on this day. My hobbily leg was grateful. The montane rainforest was lush and warm. Clumping ferns rose from below, wispy moss and tapering vines waved from above. The canopy often blocked light and deadened sounds. Apart from the tramping of boots against earth, a hard exhale, grunt, or an occasional conversation, the only sound was that of elusive monkeys. They stirred the leaves in their hiding places above and beside us. The start of the uphill march. Photo by teammember Jason Wilcoxon. For several hours we tunnelled uphill. It was a different kind of sensory experience: green and brown, green and brown, over and over again. In time, we broke through to a clearing. Before us was a campground. It was little more than a wide spot on the trail, but surprising for the suddenness of colors, peoples, sounds, and smells. Domed tents of orange and yellow filled the space from forest wall to forest wall. Robert cut his way through the nylon maze and found our area. It was located toward the back in a plot of our own. This was our nomadic village. The porters had already pitched personal tents, porter tents, a kitchen tent, a mess tent, and a nylon port-a-potty. A bright young man relieved me of my pack and showed me to my space. 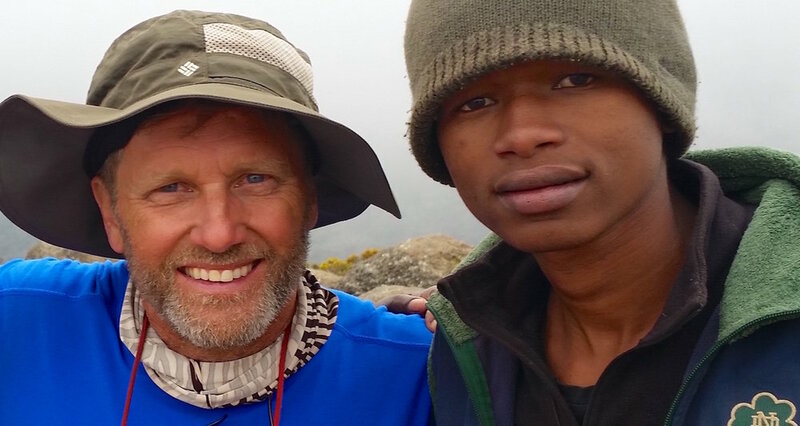 As I would learn, Dennis had been assigned the job of taking care of me on the mountain. I hoped to make him my friend as well. Dennis was assigned the job of taking care of me. Poor guy!